I made this outfit for my cousin Holly’s wedding which took place a few weeks ago in Bonnie Scotland. I’m not very good at knowing what to wear for special occasions so I knew I wanted to make something specifically for the wedding that I really liked. 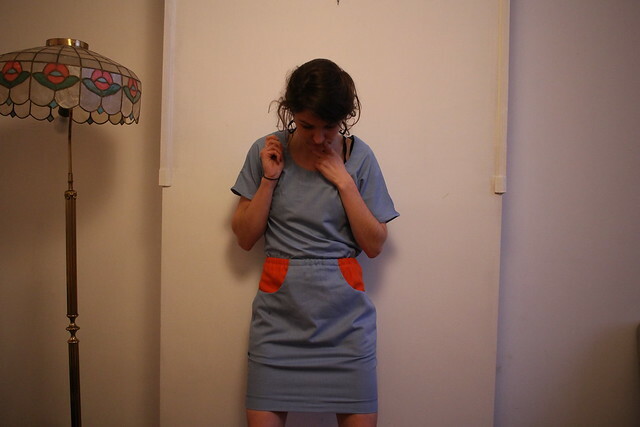 I set myself the challenge of sewing something from fabric I already have rather than buying more. 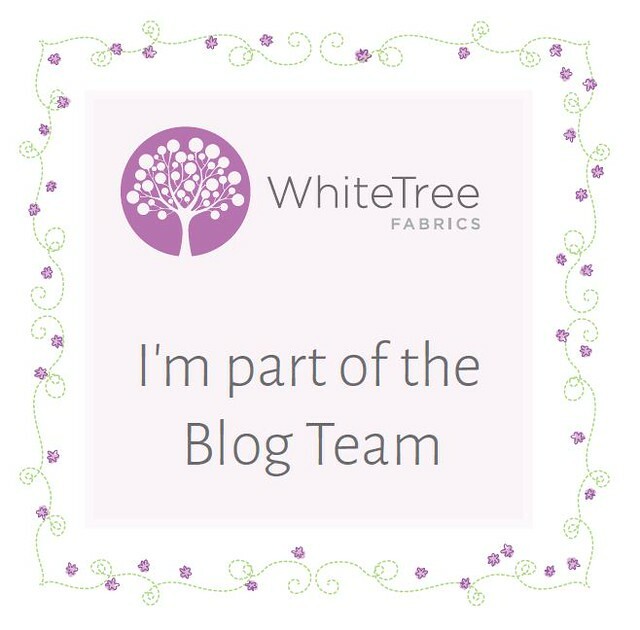 This was also a way of helping me decide what to sew – i.e. 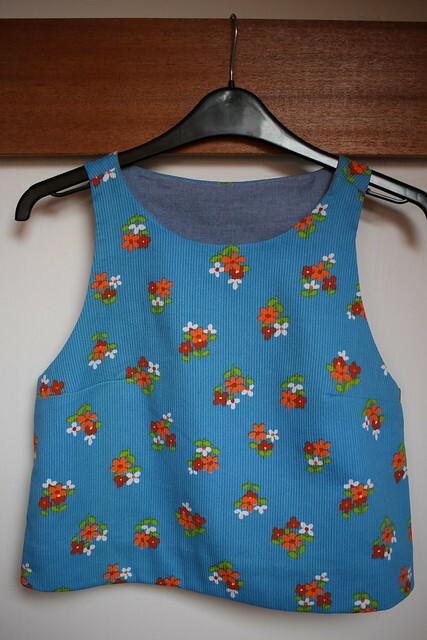 I started by choosing the fabric and then deciding what kind of style I wanted to sew, rather than the other way round. I bought this fabric a few years ago in a shop in the Montmartre in Paris. I absolutely love it and I’m so glad I finally made something with it! It’s quite sturdy and I think it is perfect for making something look a bit more formal. 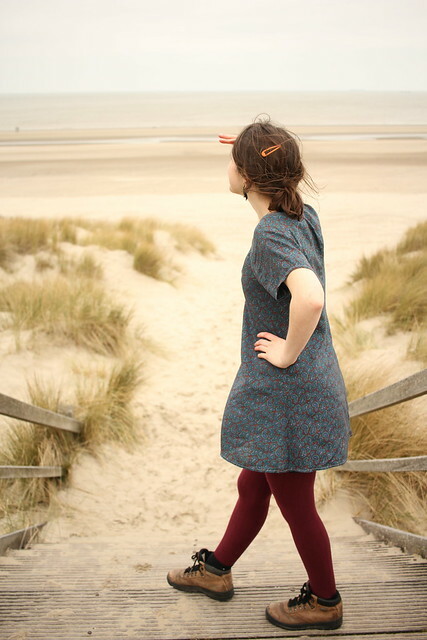 After much deliberation I decided to make a two-piece outfit and make the skirt from the Deer & Doe Belladone dress and the Tate Top from Workroom Social. 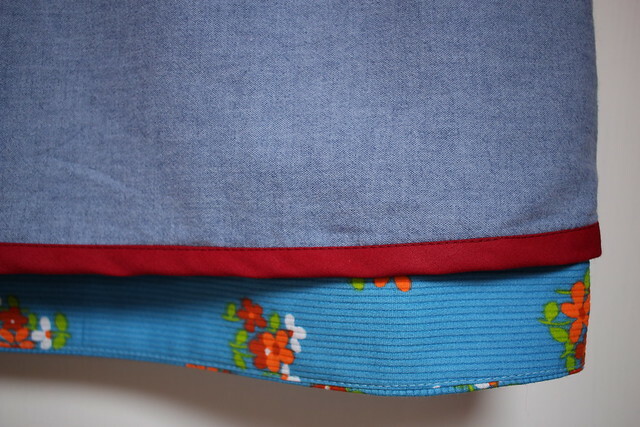 For the skirt I lined the waistband with some soft denim and added a lining. 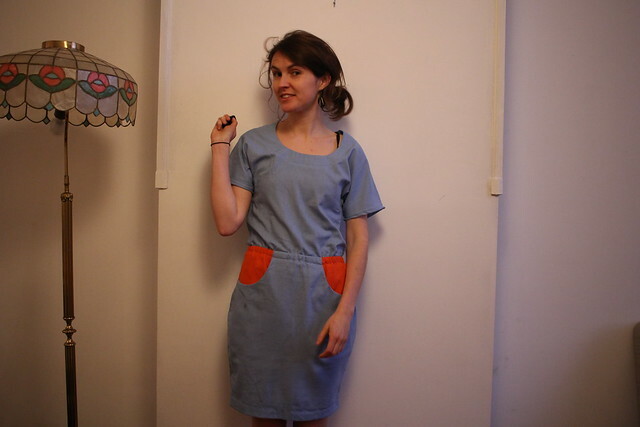 I’m really pleased with the overall finish and think it might be one if my best ever invisible zips! 🙂 One of the things I love about the Belladone pattern is the slip stitching required for the hem facing. 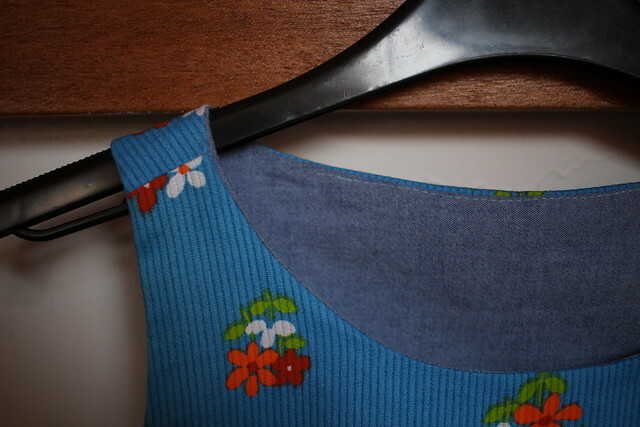 I think a hem facing is such a good way to finish any garment. For the Tap top I made quite a lot of changes: I adjusted the length to make sure it stopped just before the skirt. 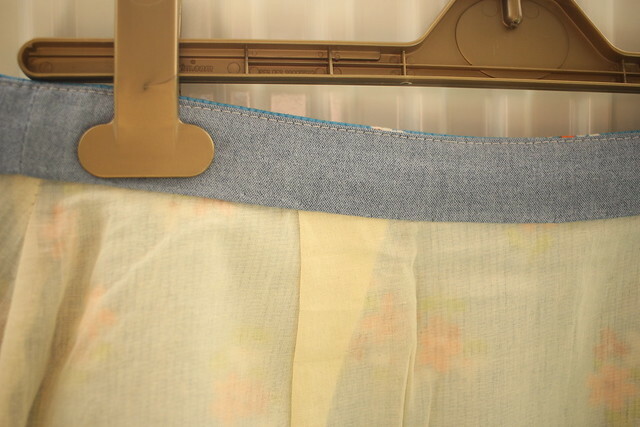 I moved the front neckline darts to the underarm position – and I moved the back darts so that they are in line with the front darts. 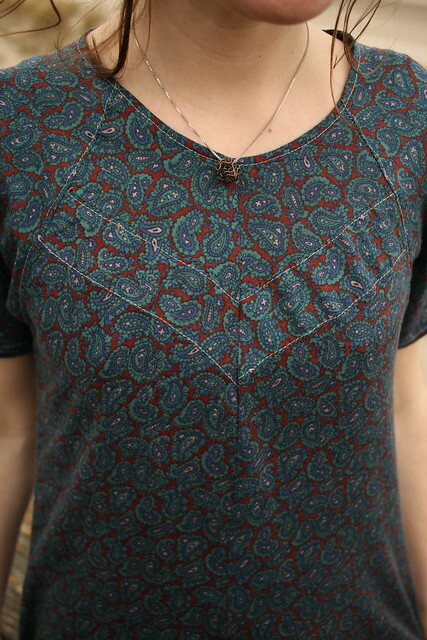 I decided to use this wonderful video tutorial from Sew Over It and do an all-in-one facing as I think this gives the cleanest finish. 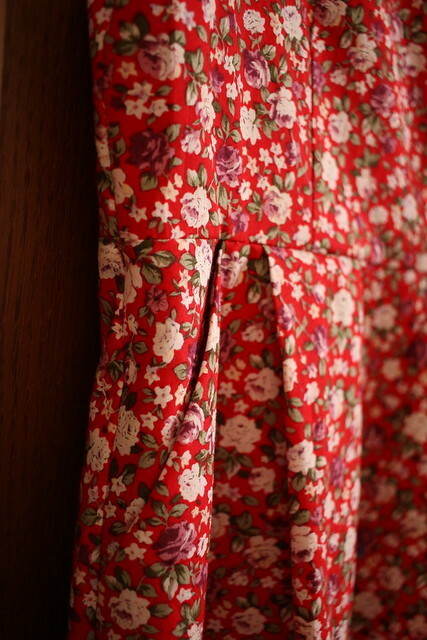 I used a hem facing for the outer fabric and I finished the all-in-one facing with some red bias binding. 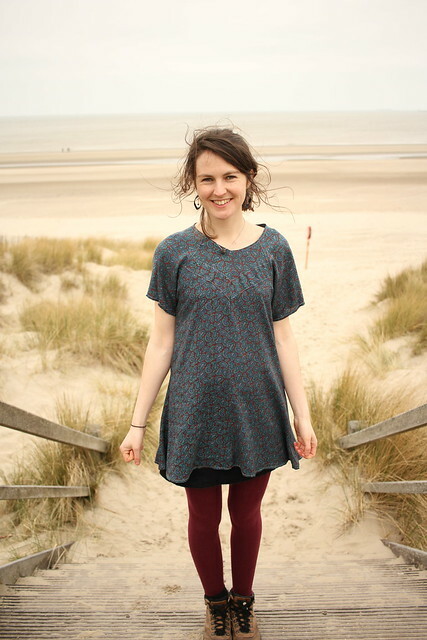 It wasn’t my intention when I started but the top is actually fully reversible and can be worn both ways! Result! Overall I’m really happy as I made two garments I enjoyed wearing for a special occasion but they will also get lots of use in everyday life worn separately! I had barely finished the final stitches of my blue plaid coat and for some strange reason I decided to plunge straight into another coat making project. It’s interesting how we pick projects – why do we have ideas for some things and then take months to get round to taking any action, and others just spring from nowhere and the wheels are in motion before you can stop to think about it? 1) The fact I don’t really have a proper waterproof jacket (a bit strange considering I’m from Scotland and live in Belgium, and love cycling and being outside..). Every year I feel as if I muddle through and by the time I think of getting one it’s nearly spring. Maybe I’m not as outside as I’d like to be! So I had thought about trying to make one but didn’t really seriously entertain the idea. I just bought some very cheap yellow and red waterproof material on a whim in Berger a few months ago with the vague idea of making one at some point. 2) I’ve been seeing wonderful yellow jackets everywhere for a while now. It seems the yellow raincoat is very à la mode en ce moment. 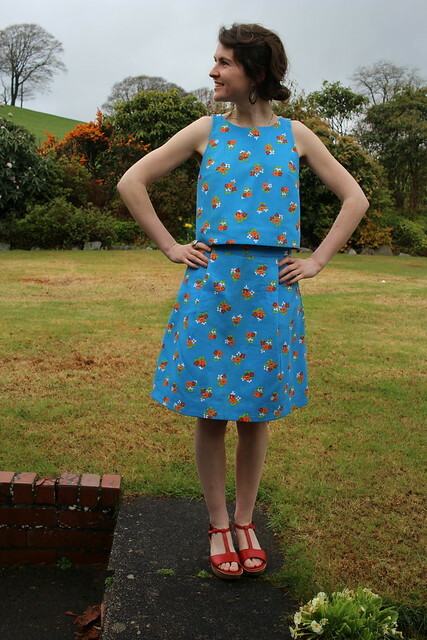 3) Then I found out about Make My Lemonade – partly through my flatmate (who also sews, yay!). 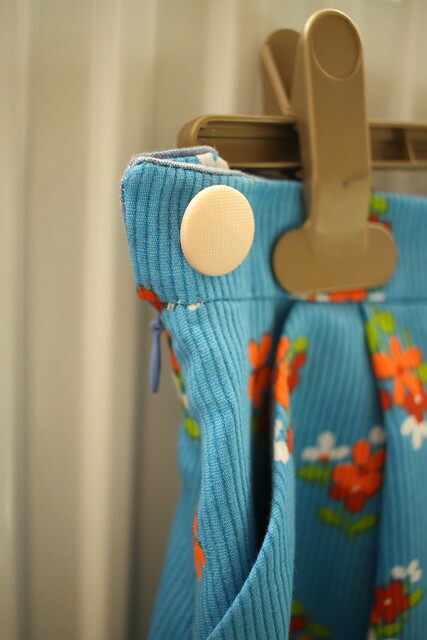 And through Jo’s post about her great Paloma shorts. Looking around on the site I found the Rita pattern which set the lightbulb off in my mind and the project was born. So before I knew what was happening I was in the midst of making a raincoat! Rita is a great basic (and free!) pattern but I made some significant modifications to it: I lengthened the sleeves, added a fleecy lining, and added a three-piece hood. 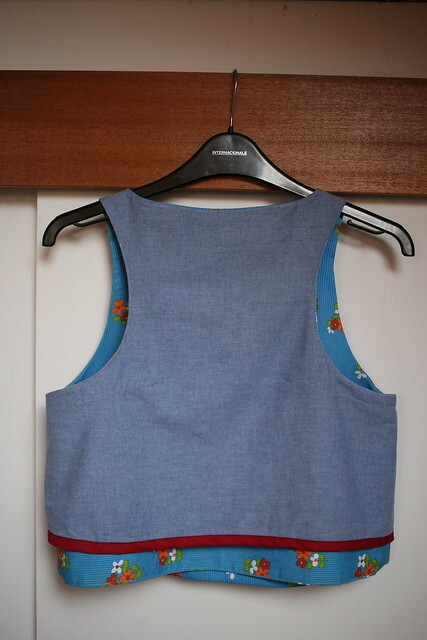 I really love the back pleat and yoke and wanted to accentuate them by using a contrast colour. account the extra bulk of the fleecy lining. It’s a bit tight under the arms so I can’t really wear a big jumper with it. It’s fine with a thin jumper or cardigan though. 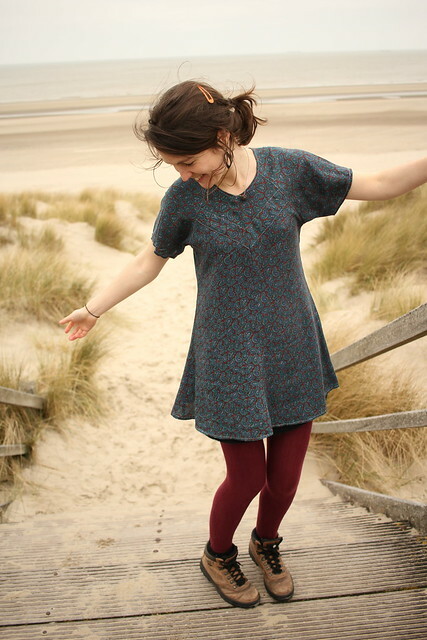 If I make this pattern again I’ll also lengthen the sleeves a tad. The only part which was a headache was adding snap buttons! Argh!! For the life of me I couldn’t work out how to put them on. I tried so many times but they just wouldn’t stay on the material. In the end after much deliberation (and hammering) I took the nearly-finished coat to a couturière to see if she could add the snaps on – and she did! I thought it would be better to actually pay a bit more and get the project finished properly rather than ruining it by messing up the snaps. 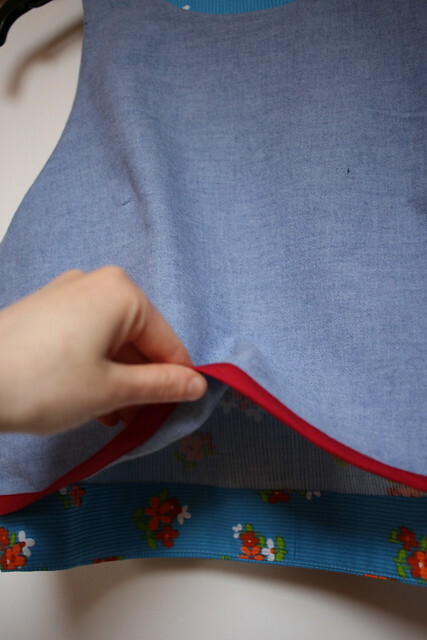 I’d like to master snaps though myself as I’m not a massive fan of sewing buttonholes! 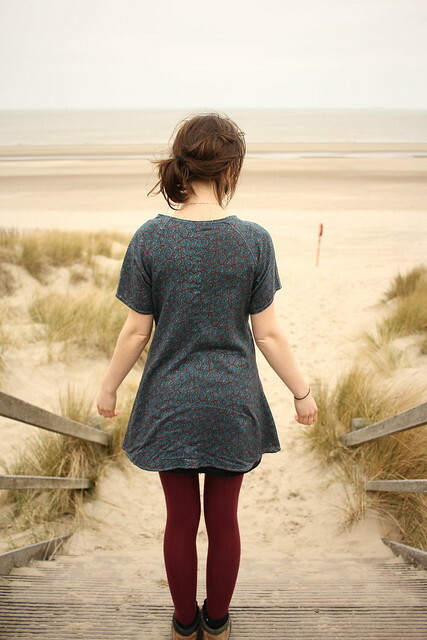 I think it is great for pottering about when it is a bit rainy but not that baltic. So far I’ve worn it in light rain mostly, and once in quite heavy rain on my bike – I was surprised that it kept my quite dry, although as it is not the best quality waterproof material I wouldn’t set off on a hike with it or anything. But if it can handle my 10 minute cycle to work that’s good enough for me. If I can get my hands on some good quality waterproof fabric I’ll definitely think about making another raincoat. It’s no North Face-type jacket but I really love it and I think this is one of those moments when you have to stop yourself from being overly critical and remind yourself that you made a raincoat. Yes! 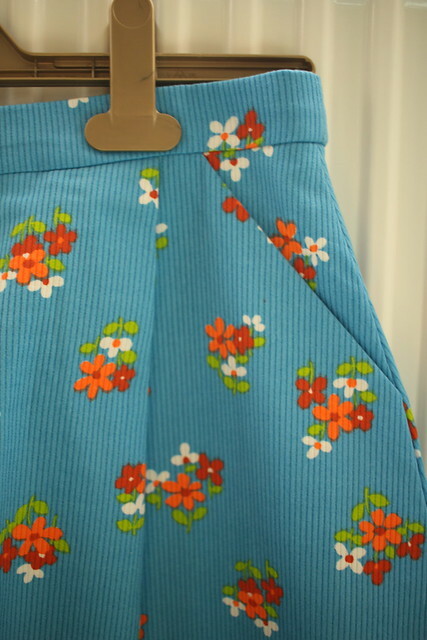 I really love A-line shaped skirts and have seen so many nice versions over the last few months as 1970s-style skirts seem to be all over the place. 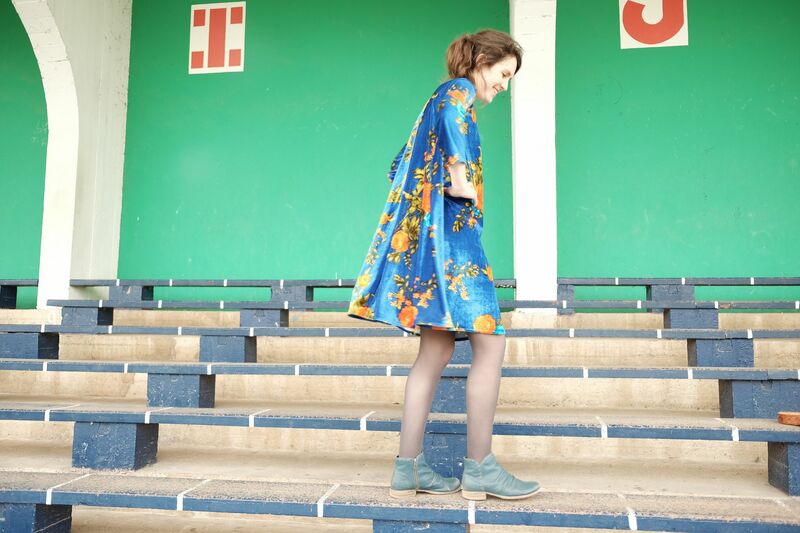 So when I saw the Rosari skirt from Pauline Alice online I added it to my ‘want list’ of patterns but said to myself I didn’t really need it…and then I subsequently bought it when I saw it in a new sewing shop in Etterbeek, ‘Chipote et Papote’…whoops. I decided to sew a winter-appropriate version so I used this purple/white wool which I got at the Marché des Abattoirs ages ago and I used the last remaining pieces of the best lining fabric I’ve ever come across (bought in La Maison des Tissus). 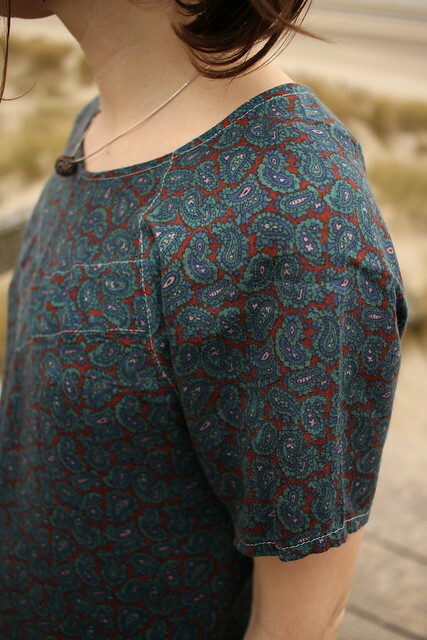 It’s a kind of ‘lined lining’ – shiny and slidy on one side but rougher on the other side giving it a ‘sturdy drape’ (if that is such a thing!). I worked on this over Christmas at home in Scotland and finished it back in Brussels and I’m really happy with the result and have worn it pretty much all of January! For once I actually made something that was missing in my wardrobe that I really needed; a basic skirt which is still interesting enough that I enjoy wearing it!